While it’s easy within Print Manager Plus to set a quota and apply separate costs for Color versus Black & White printing, sometimes this isn’t quite enough, or doesn’t yield quite the level of control desired. Many color devices are very costly to operate, even when printing black and white documents. In these situations you may want to group these devices together and provide a separate quota system for them. 1. 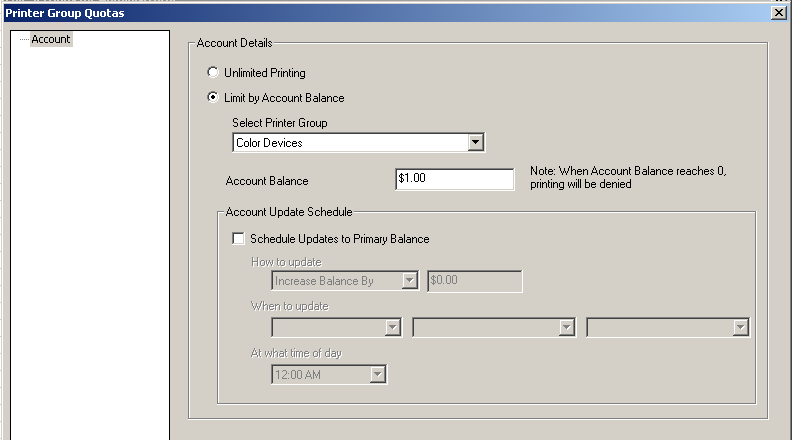 Within Print Manager Plus, select a printer you would like to assign as a Color or Black & White device and open its Properties. 2. Within the properties for that device, specify a Printer Group. In this example we typed in the name as Black & White Devices. 3. Once you have all of your Printers grouped, you will see this populated within the Printer Group Column. NOTE: This can also be used to quickly sort your printers from the Printers tab; or within Reporting to report on each grouping of devices. 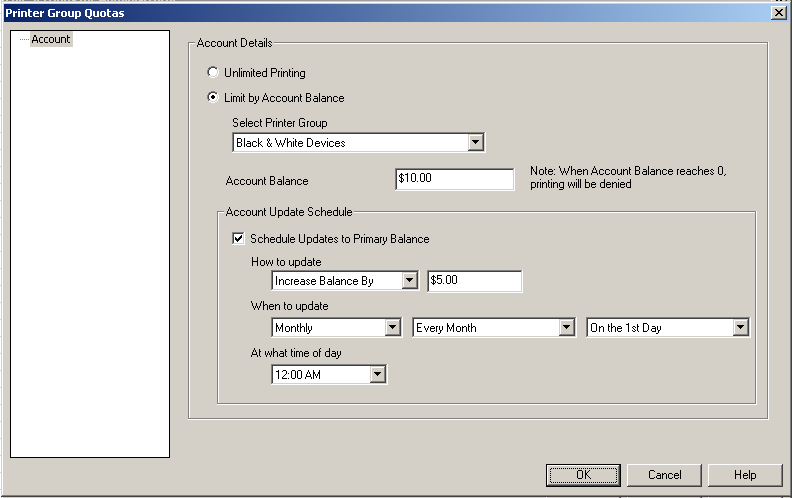 When setting up your quotas, use these options to set separate quotas for Black & White and Color Printers. 1. 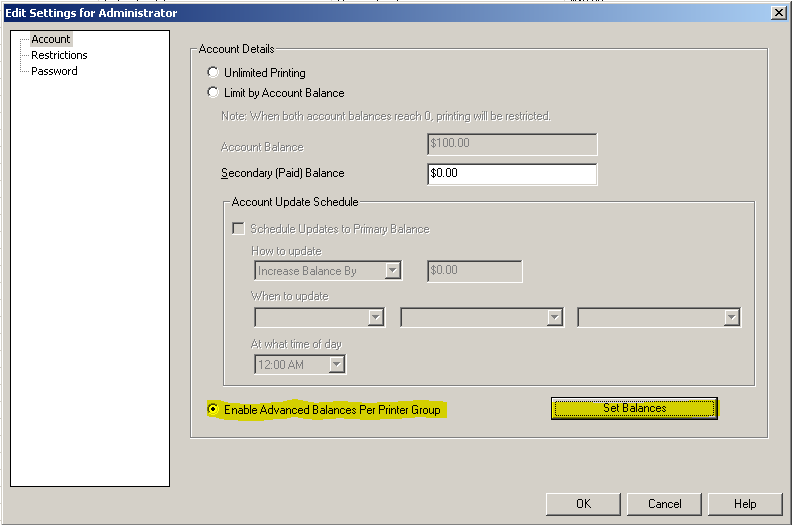 Open the Organization Unit, Group or User you are setting quotas for and choose Enable Advanced Balances Per Printer Group Option. 2. From Here you will be able to click Set Balances. Here you can provide a separate quota for Black & White Devices and Color Devices. Note: The quota labeled "*Default" is the quota that will be applied if a printer is not assigned to a group. Once these settings are in place, each user will have multiple quotas that can be deducted separately. Leave Black & White printers’ quota to Unlimited while leaving a balance that applies only to Color Printing. This is ideal for situations when printing is a must, but tight control of color devices is needed. Group printers by other criteria for quotas, such as Device type, Department, Budget Group and more.